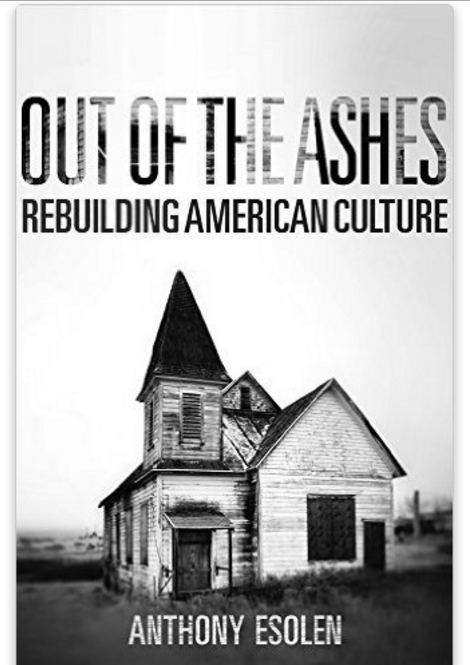 The embattled and shockingly non-respected Anthony Esolen (the filled-diaper crowd are flinging contents of same at him) has a new book arriving early next year: Out of the Ashes: Rebuilding American Culture . Looks to be a book we’ll all be talking about. Below are highlights of the Plan from the Introduction. Discuss. Let’s get straight to the point. We no longer live in a culturally Christian state. We do not live in a robust pagan state, such as Rome was during the Pax Romana. We live in a sickly sub-pagan state, or metastate, a monstrous thing, all-meddlesome, all-ambitious. The natural virtues are scorned…A man who fathers six children upon three women and now wants to turn himself into a “woman” attracted to other women—he is praised for his courage. Justice means that a handful of narrowly educated and egotistical judges get to overturn human culture and biology, at their caprice. It does, after all…The next person you greet may be on the verge of sainthood or damnation. Every moral choice we make repeats the drama of Eden. No one can do everything. Everyone can do something. Begin. Update Coincidentally today, Esolen on Love, Liberal Education, and the Secret of Human Identity. Thanks William. I just ordered the book. As the next step a network of like thinking individuals needs to be created. Perhaps you could comment on how we might go about knitting such a network to create a cyber relay team to spread the word and take appropriate actions. Money could be raised like Trump did it, one dollar at a time. Hopefully, your subscribers will have some thoughts on a roll-out plan. As a chronicler and connosieur of the origin, strategy, tactics and beliefs of the Politically Correct Progressive destructors of Normal-American culture ( http://www.willingaccomplices.com ) , interviewers and readers nearly always ask: Ok, you’ve cleary explained how we got to where we are now. So what can we do? My response is usually: Wish I could tell you. But I can’t. You now understand the opponents of Normal-America. Armed with that knowledge, you now must create strategy and tactics to accompany the beliefs of Normal-America, and to accompany the plan to recover Normal-America. While Esolen appears to have a solid plan to promulgate Normal-American culture, for Normals, the review above does not mention a plan to deal with the cancerous influencers burrowed into the transmission belts of our culture (although I have not yet read the book, so maybe he does deal with this) . Applying the prescriptions described in Matt’s review to our personal and community lives is a solid first step. But it’s sort of like putting sunscreen on a metastasizing skin cancer. The fundamental cultural rot will not go away without some sort of action to destroy the root viral infection. What action?, you ask. Again, it’s up to you, armed with the knowledge of our opponents and their tactics of destruction. A thick layer of sunscreen will not excise the cancer eating away at our core. Esolen, as a self-asserted “Christian” that wants [so-called] “Christian” values in the forefront, is scapegoating the failures of “Christians” themselves and making it appear the problem is elsewhere in society (which is only partly true). The very first topic to address is define what proper “Christian” values, or whatever, are and then focus on identifying & rooting out the heretics. So much, perhaps a sizable majority, of so-called “Christianity” in the U.S. is heretical. About that there isn’t much, but “Bad Religion, How We Became a Nation of Heretics,” by Ross Douthat, isn’t so bad. Example (one of thousands): Episcopal denominations have split over the ability to tolerate, or not, gay clergy/marraige/etc. One side must be wrong. And so it goes within & across denominations over a myriad of issues, large & small. Until that problem of “Christian” heretical diversity is addressed & resolved, the rest of society is going to continue on its present course unimpeded by true Christian influence. Back in the 1920 (pre-Great Depression) was a doctor that compared blood test results, parents vs babies born and found [what would now be considered unethical study results] roughly 20 percent of the children could not possibly be sired by the marital father. It took to 1956 for the motto to become officially legal. Twain’s quotes’ popularity has stuck because most of us recognize the truth in his observation — most, or half-ish, of society only maintained/s a facade of such faith while practicing something quite different. So many people assert “Christian” values…but what that means, today, in actual practice is anybody’s guess — less so now given the mutually incompatible doctrines espoused by so many “Christian” churches. “Christianity.” Such a fear is valid. Christianity, in its original true form, not only weather a pagan Roman society but eventually won it over — so such social changes today ought not really pose any substantial threat. However….now, given modern “Christianity’s” largely fractured & heretical status, it is ill-equipped to persist under such open confrontation. Whatever the non-heretical “Christian” values are that society ought adopt…won’t happen until the heresies are exposed. And then dealt with. Thanks, William – I, too, have ordered the book. I’m not one to “shelter in place” while the store is getting shot to hell (literally!) when I have any way to fight back. May I, however, offer a bit of caution about any immediate effort to create a structure and raise money. We’ve seen all to clearly what happened to the Tea Party. The forces of evil are very good at the co-opting game. Good stuff Ken. I am not so sure that Christianity “won over” pagan society as much as defined and ostracized what being a pagan was. Today Christianity generally refuses to define sin and thus can’t condemn it. This could not be better illustrated than with our dear Pope Francis trying to redefine adultery in his letter Amoris Laetitia. In our modern age, wonder of wonders, sin is being redefined as normal by our Christian leaders. We have come to a not so pretty pass. Sounds more like we live in a sickly sub-Christian state, instead. Right? Otherwise, why bother rebuilding Christian culture? Who knows how to properly use the zipper? A man who fathers six children upon three women? I bet he does, otherwise he would have hard time to fathers six children upon three women. What is a sub-pagan school exactly? Very good article, Mr. Briggs–great advice, except that you left out the study and reading of scriptures as a counter against neo-paganism. The words of Jesus and the testimony of the apostles are far superior to Plato, Aristotle and Confucius. Wow! I added this to my Amazon wish list mere days before your post. Er – something about “great minds” *cough, cough. * Great post, thanks!